Canter along deserted ocean beaches, ride the bluffs while the Pacific crashes against rocks far below, and meander on mossy trails through the magnificent Redwood forest on this distinctive vacation on Northern California's rugged Mendocino Coast. This is an area of great beauty, rich in wildlife, where time flows at it's own pace; the ghosts of Russian, Spanish and English adventurers tenaciously cling to this isolated part of the world. Lari Shea, winner of dozens of endurance events, including the prestigious Tevis Cup 100 Mile Endurance race, breeds Akhal-Teke, Russian Orlov crosses, and Arabians, many of whom have excelled in dressage and jumping, as well as on competitive trails. Her Appy and Quarter horses round out the stable of wonderfully well-trained horses, for both English and Western style enthusiasts. You won't believe the quality of the horses! The Redwood Coast Riding Vacation ranges for many miles along ocean beaches, through a working cattle ranch, and up into the coastal mountain range, richly covered with towering conifers, offering views that stretch to eternity. Lodging is at the luxurious and historic Mendocino Hotel in the Village, and at two unique B & B Inns by the ocean, complete with elegant dining including fine California wines, delightful hot tubs under the stars, and internationally acclaimed musicians entertaining you at night. 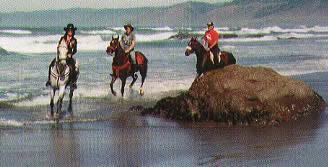 Join other compatible RRR riders on special weekend riding getaways in Mendocino. You will arrange your own lodging, meals and nightly entertainment. Our well-trained English or Western horses are available to suit all riding abilities. Sign up for as many or few days each weekend as you like. Carpool information from the San Francisco Bay area is available, as well as recommendations for local lodging and camping. If you should choose the Mendocino Hotel, we are happy to process your reservations. This ride truly provides a combination of beautiful landscape and quality riding. The contrast of the majestic Redwood forests and the long, barren , sandy beaches of the Pacific Ocean in this rural area of Northern California, affords some wonderful opportunities for long canters. The horses, trained for endurance riding and dressage, are exceptionally fit and a joy to ride. The week provides a wonderful variety of lodging. The Cleone Lodge provides ranch style accommodations in a beautiful setting of wooded acres. Sun decks, a jacuzzi and lending library add to the appeal of this inn. The DeHaven Valley Farm Bed and Breakfast is a charming, historic, Victorian house with a jacuzzi, situated on 20 acres overlooking the Pacific Ocean. Decorated with Victorian Antiques, the historic Mendocino Hotel is an elegant place of lodging that combines modern amenities with history. A full breakfast is provided each morning at the respective place of lodging. Following breakfast, clients will prepare their own picnic lunch choosing from a wide variety of meats, cheeses, fruits and vegetables, candy, trail mix, and juices. Dinners are at riders own expense with many excellent local restaurants from which to choose. A variety of horses are available, including Arabians, Russian Orlov Crosses, Thoroughbreds and Appaloosas. Great care is taken to match each rider with the perfect horse. English, Western, and Australian tack is utilized. Pommel and cantle bags are available for your cameras and personal belongings. Seat savers are provided. We are able to accommodate beginning through experienced riders. More experienced equestrians will be able to trot and canter as well as walk. Instruction is available for all riding levels. 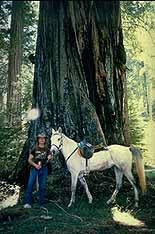 If you want to stay in the Mendocino area we will be happy to coordinate your lodging.